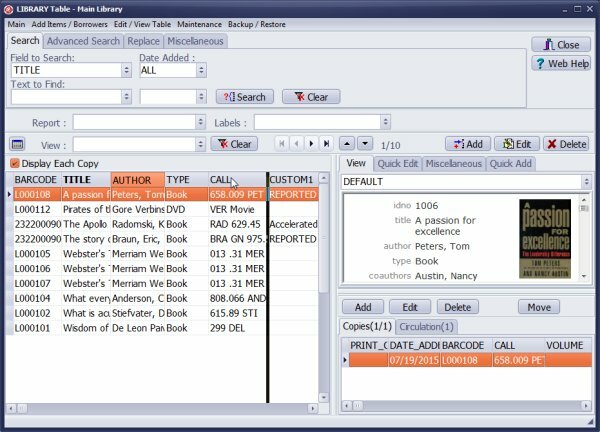 ﻿ Handy Library Manager, tutorial: how to modify library grid. 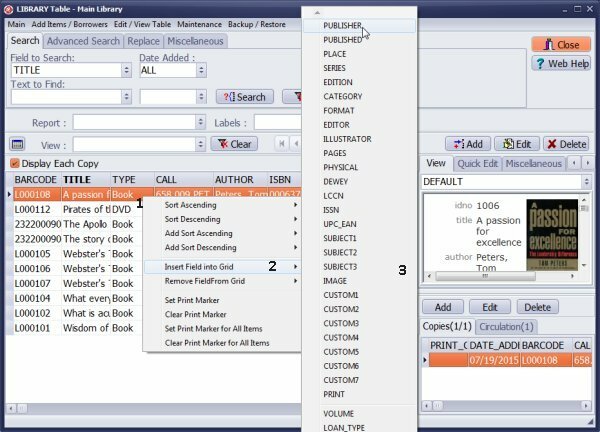 Help, how to topics > Library Main Catalogue > Library Grid, how to change number of columns, how to modify size, how to change position? 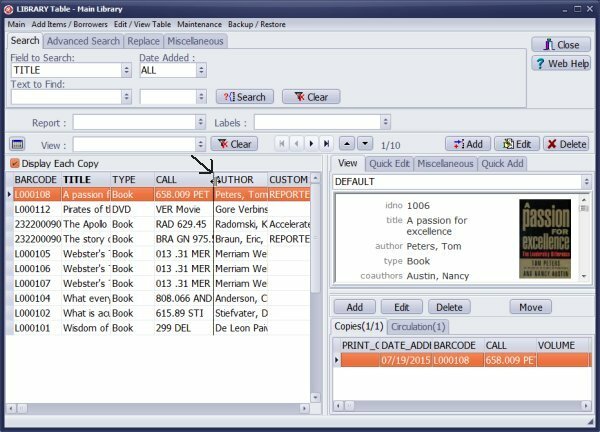 Library record grid gives you a quick view of a certain number of records at once. The number of records depends on the main window size and the screen resolution. This number can be changed by adjusting the size of fonts in the Options window (Options/General/Use Large Fonts). Record Grid is controlled by the Header which determines which data fields are displayed, in which order, and how wide each field is. 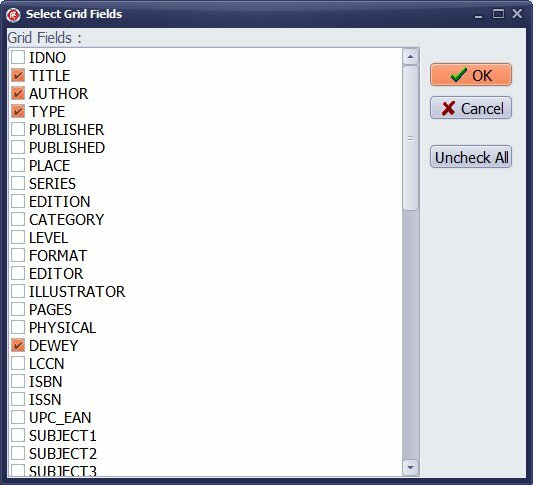 Click with the right mouse button on the grid to display popup menu with the following commands: Sort, Insert Field Into Grid, Remove Field From Grid, Add/Remove Fields, Save Grid Layout, Set, Clear Print Markers. Click with the right mouse button on the grid to display a popup menu. Click Add/Remove Fields, it will display the Select Grid Field window. Click Uncheck All, then select only fields that you want to include on the grid. Note 1: when you click Uncheck All it will check IDNO, after you set your fields you can uncheck IDNO. Note 2: open the grid popup menu and select Save Grid Layout. Click with the right mouse button on the column name, hold it, and drag left or right to a new position. Release the mouse button. The column position will be changed. Drag right to a new position. Release the mouse button. The column position (AUTHOR) will be changed. Note: open the grid popup menu and select Save Grid Layout. To display popup menu click with right mouse button on the grid (1). To Insert , select Insert Field Into Grid (2), and select the field (3). To display popup menu click with right mouse button on the grid (1). To remove, select Remove Field From Grid (2), and select the field (3). 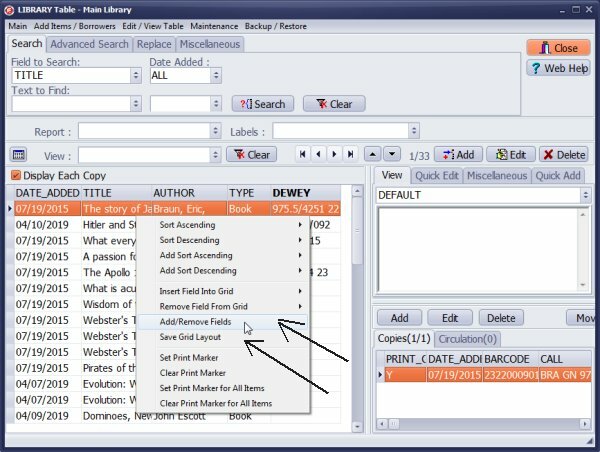 Position the mouse cursor over the column division line in the header so the cursor changes to double arrow. Click the left mouse button, hold it, and drag left or right. Release the mouse button. The column width will be changed. 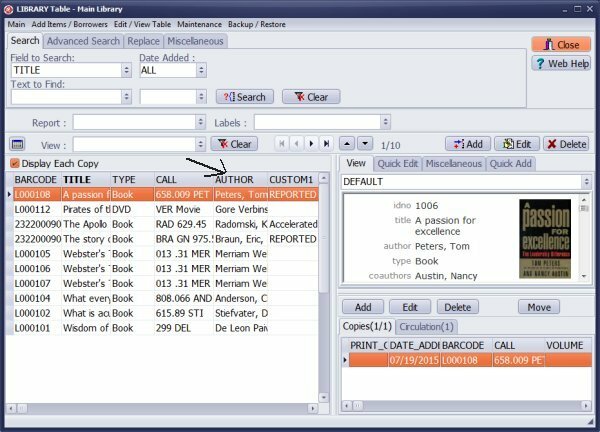 Question: After entering a book, where do I go to make sure it has been added to the library? I am entering books and some have gotten mixed up. I don't want to show two copies, if I only have one. Answer: Include TITLE on the grid, sort library items by TITLE. New item is entered into the ADD window. When you close the Add window, the new item is selected in the library table (on the grid). 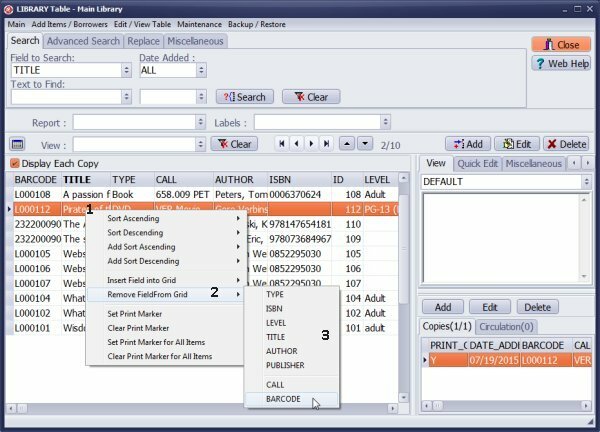 Items with the same or similar title will be listed before or after the selected record. 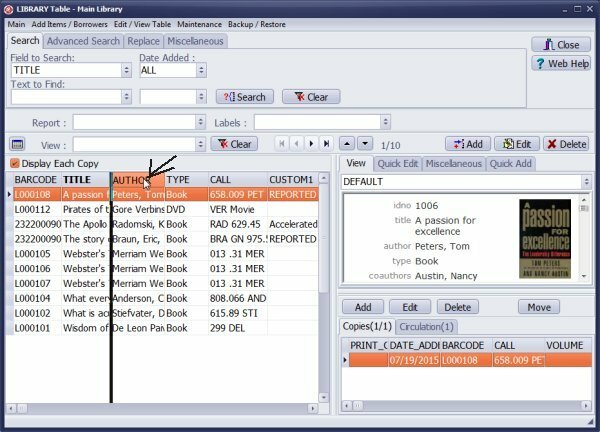 If library materials are already entered use search by TITLE to display or verify multiple item/copy entries. Question: How to change the display field length? When viewing the Library Table (Main Library), is there a way for us to increase the size of the TITLE field. It appears to be displaying about 20 characters. We would like to see about 30. Answer: In the above topic review the part about changing column width.